← New Memorial to WW2 Winkton pilots unveiled in Periers, France. 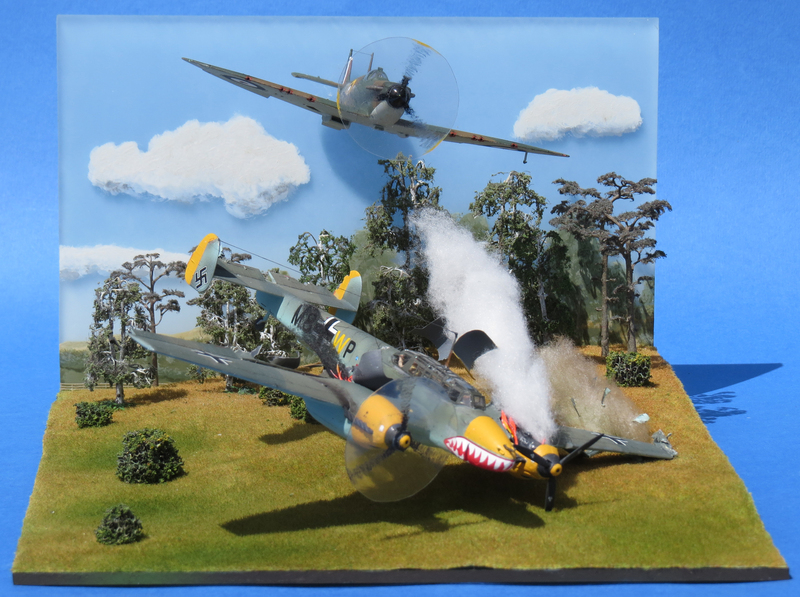 A new model diorama has been added to the Spitfire Mk I/Messerschmitt bf110 cabinet in the FONFA Museum, depicting the shooting down of the German fighter at Blackhill, south of West Wellow, by Flt Lt J.H.G.’Butch’ McArthur of 609 Squadron, based at Middle Wallop, at 1745 hrs on 15th August 1940, at the height of the Battle of Britain. Recent visitors to the FONFA Museum will be familiar with the five feet long propeller blade from the bf110, kindly lent to the Museum on long term loan by Mr Neil Parsons and his family, whose uncle witnessed the end of the dogfight, before the bf 110 crashed killing the crew of two, FF Fw Franz Wagner and BF Uffz Fritz Spörl. The two Luftwaffe airmen were buried at the Cannock Chase German Military Cemetery. Full details of the incident and photographs taken on the day after the crash are displayed in the Museum. 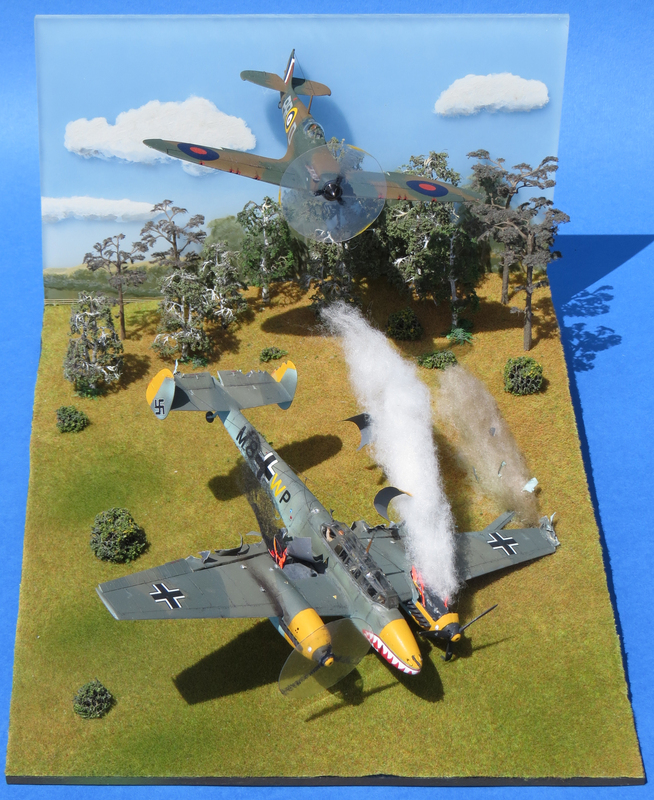 Flt Lt McArthur had taken off from Middle Wallop, during the second German air raid on the base in two days, and had already shot down another bf110 at Slackstead, north east of Romsey at 1735 hrs. His combat report then continues, “I turned south and kept climbing until about 2000 to 3000 ft above the party (the large dogfight west of Southampton). “I picked out another 110 which was straggling a bit and carried out exactly the same attack with the same result except that this time only one engine went on fire but the starboard wing seemed to be burning as well, the ammunition ran out at about 20 yards.” The propeller blade was removed from the crash site the day after the crash and stored in a garage/workshop by the family of Mr Neil Parsons, who still lives in the same house as his uncle did at the time of the crash. The aircraft was a twin engined Messerschmitt Bf 110C ‘M8+WP’ of 6./ZG76 and each engine had three propeller blades. The blade was stored for 77 years in the roof of a workshop, suspended by chains and only displayed to the public on two occasions at a local village fete. The chains have caused some electrolysis of the propeller’s metal but the bulk of the blade has remained intact. In addition, there is some trailing edge damage on the blade, which may have been caused either by the crash impact or by gunfire from the pursuing Spitfire. The blade identification numbers are still legible in red paint. The propeller boss is extremely heavy. Damage to the tip is slight, which suggests that it broke away from the engine immediately in the crash, and that either it was rotating slowly or already feathered, i.e. not under power, at the moment of impact. This would imply that it was from the port (left) engine, as this was reported as being on fire before the crash by Flt Lt McArthur, when he closed to ten yards distance in his Spitfire Mk.I, immediately before the impact. 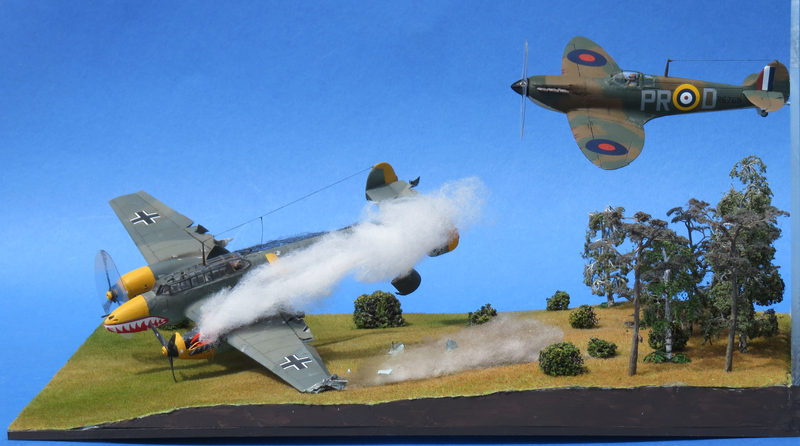 The diorama, modelled by FONFA Chair of Trustees Dr Henry Goodall, depicts the moment of impact, when the Messerschmitt struck the ground.